Place an oven rack in the middle of the oven and preheat to 350 degrees. Arrange the nuts in a single layer on a baking sheet and toast for 7 – 8 minutes, or until fragrant. Don’t overcook them or let them get too brown. You just want a light toasting. Cool completely and then coarsely chop. Line a baking sheet with parchment paper (or grease generously with butter or cooking spray). To get uniform shape and size, use an ice-cream scoop. But you have a choice on which size you use, depending on how many cookies you want and what size cookie you want to make. You can either use a large scoop (about 2 1/4″ in diameter) or a small scoop (a little over 1 1/4″ in diameter). For both, drop the dough onto the prepared baking sheets, spacing them about 1″ (for the small) or 1 1/2″ (for the large) apart. Bake 7 – 8 minutes for the small or 10 – 12 minutes for the large, or until the cookies are brown around the edges (and on the bottom). Don’t overcook. The cookies are done if they are brown around the edge and bottom, so don’t cook until they are brown on top. It’s okay if they are still a little soft in the middle. Depending on your oven, you may need to rotate the cookie sheet halfway through baking for even browning. Let the cookies cool slightly (and “set”) on the cookie sheet before transferring them to a rack to cool completely. Repeat with remaining dough, cooling the baking sheet between batches. Go ahead and re-use the parchment paper. Just wipe any visible oil droplets or baked crumbs from the parchment paper between each batch. 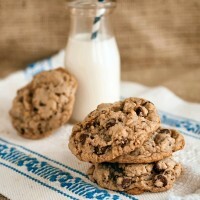 * Cook time is for each batch (large cookies); for small cookies each batch is 7-8 minutes. Hostess’ Hint: These cookies can be kept in the freezer in an airtight container for up to a month. I just made these cookies and they are the best cookies I have ever made. My husband agreed, too! Wonderful recipe, thanks! S., Thanks for the feedback. So glad the cookies turned out. As you know, these cookies are a favorite in our house.